Ranking is a very usual requirement of BI reporting. People tends to sort things in order and focus on the top performers. Which sales region is generating the most of revenue? What are my most popular products? Who are my best performing employees? All these type of queries can be easily answered via invoking the Rank() function on relevant fact measure. A few days ago, I was reviewing my prior post and something unusual caught my attention. 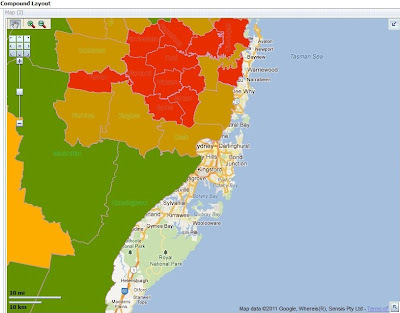 How come those densely populated suburbs in Sydney are not covered by the thematic view for postal areas??? In order to further confirm the issue, I moved the map around to another state and I found some thematic views are put on Tasman sea (see below)!!! I've got an alignment issue. 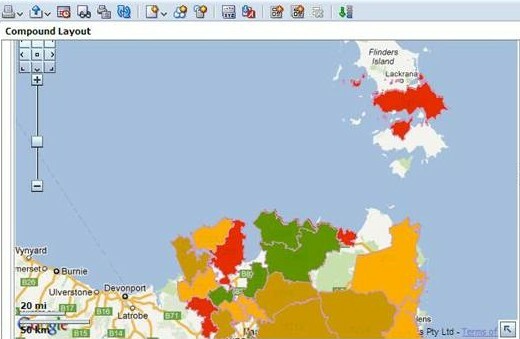 In my last post, we discussed how OBIEE enables geospatial analysis on digital map. Now it’s time to get hands dirty and learn more from practice. Only month 1 to 6 are selected. First of al the original inspiration for these “Golden Rules” Series are based on the “20 GOLDEN RULES FOR REPOSITORY DESIGN” from the people at Peak Indicators. Kudos to them. This is always a “work in progress” and please feel free to make any suggestions! - use a transport folder. First of al the original inspiration for these “Golden Rules” Series are based on the “20 GOLDEN RULES FOR REPOSITORY DESIGN” from the people at Peak Indicators. Kudos to them. I just added my own observations. The “rules” is this article are somewhat in random order. The first column you select for your report should always a column from your time or calendar dimension. Time is often the most consistent aggregation splitter. And most database use partitioning along a time-line. Hot on the heels of support for BusinessObjects Voyager, and in addition to the native Excel 2003/2007/2010 pivot table access, Simba are previewing the same connectivity for Cognos8 Analysis Studio - the dimensionally aware UI in the Cognos BI suite. For those who missed it, the global launch for the 11g release of the Oracle Business Intelligence Enterprise Edition suite (OBIEE) took place in London on July 7th.